Go Family Go! 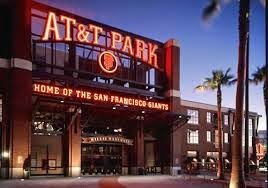 : AT & T Park vs. Comcast Bay Area..Is the ball park really worth it? Face value for tickets appears to be in a multitiered range based on God knows what, but certain opponents and days of the week and times, promotions, and of course section cost more than others; lower box ranging from $35 for a May Monday night Padres game to $91 for a Sunday 1:05pm game against Colorado to a whopping $135 for opening day, which my friends, they lost this year. This is face value. The only way you can score yourself a face value ticket is to buy season tickets or a portion of a season ticket with a group of others. A season ticket for one lower box seat (once you have paid the seat license fee, which allows you to buy the seat in the first place) will run you about $5125, and I can guess you will probably be buying more than one ticket. This price gets you into 83 home games. For the last two years Craig and I have been lucky to have bought a portion of a colleague's season ticket plan at face value. We have eight games with two (not forgetting our family is five) lower box seats ranging from 35 to 70 dollars a piece. This ran us just under one thousand dollars. Now, if you are not so lucky you have a couple options. One is to go directly to the SF Giants website. Just for kicks, today I entered a game we have, a Thursday night game in August against the Washington Nationals. We paid $56 each for these tickets, in my opinion already a lot. The best available two lower box tickets for this game through the website are in section 102, three more sections further down the right field line than our seats, in the same row. These tickets are $67.75 each, plus a $12.25 per ticket convenience fee, plus a $3.50 per order fee. Now this ticket is over $81, and it's not a great seat. 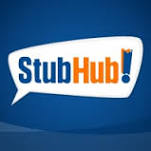 Ticket reseller StubHub.com is another option. StubHub in my opinion is a better option as you can get far better seats as season ticket holders put their unused tickets up for sale. You also have the option to pick your section and row and see the view from your seat, rather than having the computer pick "the best available." Most of my friends that choose to buy single game tickets choose to do it this way. You still will pay an upcharge though, as I suppose StubHub has to get their money from somewhere. Tickets for the aforementioned Nats game in literally our section and row were listed most inexpensively at $78.38 per ticket, but more were in the 80-90 dollar range. So how about a less expensive ticket? Is it worth it to pay less and let's say, sit in the bleachers for $34.50 or in the View Infield seats for $37.75 (plus the $12.25 convenience fee per ticket) ? Isn't every seat a good seat? Well, I've sat out there and up there, and no, not every seat is good. Out there and up there you are very far away from the action. Bring your binoculars or go home. I must say also that it is rather unprotected in those areas and if the wind is whipping and the fog rolls in, you will freeze your nuggies off--trust me. Sigh. The last time I sat in a view seat my poor mother-in-law had come from Pittsburgh and we took her as a family to see beautiful AT&T park and our World Champion SF Giants. The Twins knocked 8 runs out of Bumgarner in the first inning--so clearly I am dealing with some association issues. If view seats are my only option, Comcast Bay Area is starting to look really good. Don't think for a second that tickets will be your only expense for a night of baseball. Stadium parking is $35. You can park in other stadium lots farther away for less, but when leaving the China Basin park at 10 pm with only my teenage daughter and my keys to accompany me, this is inadvisable for obvious reasons. You can buy a parking pass on StubHub, but the only convenience or savings this offers is the opportunity to use your credit card. If it's daylight, I do have to recommend the app, ParkWhiz. When my husband went with my daughter about a week ago, he found parking through ParkWhiz about .75 mile away for $14. For a few extra steps through relatively safe environs, $21 of hard earned Temple cash was saved. Have you ever gone to the ballpark and not eaten, and not had anything to drink? Well you could sit there pathetically with your homemade peanut butter and jelly sandwich if you really want to...but for me, a lot of the ballpark experience is about the food and the beer. I am one chintzy mom. You get your meal and that's it! (Do you hear me??) But crappy beer is $11.50 ( I buy the crappy beer though now, because the good beer is $10.50, but you get 4 ounces less). I only buy one, but with one sandwich and some fries for each of us, a beer for me and a soda for my kid, I can't get by with less than about 30-35 additional dollars spent. The last time I went I went with a girlfriend on a very cold night. Now I know where the Buena Vista style Irish Coffee is sold, and how much it costs. It costs $12.50. Are you a sucker for souvenirs? I again am the great NO mom. There is a full Giants Dugout store on site, and many outlets throughout the ballpark. There is a lot of fun stuff in there--loudmouth shorts and ugly Christmas sweaters, replete with Giants colors--so if you are free with your credit card, you could spend another hundred or more. If you want unique fun souvenirs, I actually recommend the unlicensed vendors hanging out of the 3rd Street bridge on the way back to the parking lot. They often have a selection of fun and original T-shirts as well as some additional fun "gamer gear," headbands, necklaces, scarves backpacks, barrettes, etc., for far less than anything might find inside the park. Is going to the ballpark really worth it?? Friends of mine have seen amazing historic events at AT & T Park. Last year friends of mine saw Travis Ishikawa hit the walk off homerun that beat the St Louis Cardinals and sent the Giants to the World Series. People I know saw Matt Cain's perfect game, Timmy's no hitter, Mad Bum hit a grand slam. I saw all those events too, from my seat on my couch at home, and I don't feel like I missed out on much. For all the times greatness was witnessed for some lucky fan's experience of a lifetime, another fan bought way too inflated tickets on StubHub for opening day and watched them lose. can watch in your pijamas. If the game goes too long, you can go to bed. If you miss something, you can rewind it, or just watch the replay. There's no traffic, no stadium steps, no crowds and no long drives. You see angles and stats those at the ballpark are not privy to. And kids, in case you forgot---Kruk (Mike Krukow), Kuip (Duane Kuiper), Miller (Hall of Famer Jon) and Fleming (Dave) are the best announcers in the business, hands down! Here's my take. If you can get face value tickets in the lower box...it is worth it to go. Otherwise, it really is great to spend the evening with Comcast Bay Area. If you really want to feel like you're there put on your Giants jammies and make yourself an Irish Coffee. I can guarantee you can make it for less than $12.50. Well, that's my post! I'm not going anywhere for a while, except back to the ballpark on Tuesday!